Thirty years after its completion, The Dinner Party has found a permanent home at the Brooklyn Museum in the Elizabeth A. Sackler Center for Feminist Art. It is with this recognition of the monumental nature of The Dinner Party and its place in history that we offer educators a guide for including this significant artwork in the K-12 curriculum. The goal of this project is to provide teachers with guidance to help their students develop a deep understanding and appreciation of The Dinner Party and what it teaches us about women’s achievements throughout Western civilization. While The Dinner Party Curriculum has been developed by and for art educators, it is also relevant for the study of history, social studies, English, and language arts. When Constance Bumgarner Gee and Judy Chicago approached us to write a curriculum to accompany The Dinner Party, we were very excited, but we hesitated. Given the collaborative nature of the making of The Dinner Party itself, we felt that we needed to explore The Dinner Party with others and invite new voices and perspectives, especially those from the K-12 classroom. Certainly there is no one perfect way to teach about or through The Dinner Party, yet over the years we have seen examples that suggest the need for guidelines. In far too many cases of classroom practice, much of the content of this important work of art has been misconstrued and trivialized. One traditional teaching approach is for classes or, in some cases, entire schools, to have their own “dinner parties.” Some of these school dinner parties have honored male artists and popular male icons, students’ family members, and fictional characters in novels or movies. Rather than looking beyond themselves to honor the lives of accomplished women, students have been encouraged to make self-portraits by decorating plates with personal memorabilia. While these efforts have their own merits, we believe they miss the point of The Dinner Party, that is, calling attention to the erasure of women’s lives and achievements from the history of the Western world. Early in the project, we held a weekend retreat with Judy Chicago to discuss concerns about curriculum and approaches to The Dinner Party. We all agreed that understanding and appreciation of The Dinner Party requires careful and sustained attention to its various components, the role of symbolism and use of metaphor in the artwork, and the multiple meanings generated by recognition of a range of important contexts within which the work can be viewed. Students have not generally been provided opportunities to seriously investigate the multiple layers of this complex artwork. But then, neither have teachers. We quickly realized that if we were going to involve teachers in a project to create a curriculum, we would need to construct an environment in which we could all give sustained and intensive attention to The Dinner Party where we ourselves could experience the same quality of learning we wanted for our students. The Department of Art Education and Crafts at Kutztown University has a long tradition of offering summer-study institutes for the professional development of teachers. It was decided that a weeklong institute, An Invitation to The Dinner Party, would be offered in the summer of 2007. The goal would be to engage participants in a serious exploration of The Dinner Party. Teachers would be encouraged to create curricula for their own settings and to share their work with the Curriculum Team and, ultimately, with other teachers throughout the nation. Judy Chicago opened the institute, welcoming all and sharing her excitement about the curriculum project. Throughout the week, activities functioned to introduce the artwork, to raise social consciousness, to build a context for understanding the artwork in terms of feminism and feminist art, and, finally, to explore the artwork’s components, symbolism, metaphors, and multiple meanings. There were sessions on curriculum development and brainstorming for enduring ideas around which curriculum might be planned. 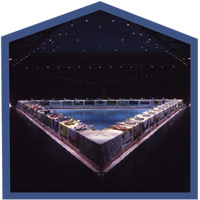 A highlight of the week was the day when, with Judy Chicago as our guide, we experienced The Dinner Party in its new home at the Brooklyn Museum. Most of the teachers who attended the summer institute submitted curriculum plans for teaching about The Dinner Party. In many cases, they provided documentation of their work with students. We were delighted to see the variety of ways that teachers took the ideas from the institute back to their own classrooms. In selecting the lessons and activities to include with this guide, we sought examples that most directly addressed The Dinner Party and that we believed would assist students in approaching and understanding the artwork in its complexity. The Dinner Party Curriculum consists of 14 “Encounters” that are adapted versions of the activities planned for our summer institute. The Encounters are accompanied by lessons, activities, and resources developed and implemented by the institute teachers. 2. Why is it important to engage students in an investigation of The Dinner Party? From its inception to permanent display at the Brooklyn Museum, The Dinner Party‘s contribution to history, art and society is significant. Designed as a symbolic history of women in Western civilization, The Dinner Party makes visible an invisible history. The Dinner Party represents women’s contributions and achievements through the use of symbolism, metaphor, and historical research presented in the form of a multi-part, multi-media art installation. All people in society benefit when they become knowledgeable about the contributions and achievements of women. Through process, form, content and media, The Dinner Party has challenged the power structures of the artworld, specifically Modernism, the prevailing theoretical framework for most of the 20th century. Judy Chicago conceived of The Dinner Party in the early 1970s and worked alone on it for the first two years. From 1976-1979 she completed The Dinner Party with the help of more than 400 women and men, mostly volunteers. Chicago let the world know that she did not work alone and credited publicly the people who helped her. This collaborative process challenged the myth of the “solitary genius” so prevalent within Modernism. In addition, The Dinner Party introduces a variety of crafts processes that support women’s creative expression in history, specifically through the media of ceramics, china painting, and needlework. The Dinner Party provides an overview of women’s history through an accessible art language. Women’s contributions must be understood within the context of women’s lives, which includes knowing the personal, societal, and institutional obstacles women faced. Feminist historian Gerda Lerner (The Creation of Patriarchy 1986) suggested a shift in consciousness, to being “women-centered” for a time in order to leave behind the exclusivity of male-centered thought. She wrote, “The basic assumption should be that it is inconceivable for anything to ever have taken place in the world in which women were not involved, except if they were prevented from participation through coercion and repression” (p. 228). The Dinner Party provides an opportunity to learn a history of women from a Western perspective, through the context of women’s lives, and for a time, with a focus only on women. 3. What ideas were important as we progressed? Throughout the process of designing this curriculum resource, we were guided by a number of ideas about art, curriculum, and teaching. We recognize the definition of art as broad and dense. Often there are many entry points into complex works of art such as The Dinner Party; thus, visual metaphors can be a means to think about art and its enduring ideas. We advocate for the careful investigation of an artwork in order to contextualize and contend with its power and layers of meaning. Art reveals insights into the human condition and human spirit. As with The Dinner Party, art is expressive when it provides opportunities to critically respond to big ideas about the world we live in and express beliefs about our past and future. We design learning Encounters that afford students opportunities to look deeply at an artwork beyond its formal elements and consider its rich contexts, including the artist’s intention, time and place of its making, and connections to our lived experiences. We design curriculum with the purpose of teaching for understanding. We begin with the end in mind the consideration of what we want our students to understand deeply and carry into life. We are interested in curriculum that transfers, where the students’ understandings are applied to new challenges in our ever-changing, complex world. The learning Encounters that we designed are grounded in enduring ideas about human experience as well as the students’ own lived experiences. Curriculum constructed on and around enduring ideas and essential questions encourages open-ended inquiry, self-reflection, and personal connections. It matters what we, as teachers, choose to include and exclude in curriculum. The Dinner Party is complex. How to best teach The Dinner Party emerges from attention to its content and context. We support substantive inquiry, affording the student adequate time to study both the work of art and life of the artist. We want our students to recognize art expression as meaning-making and we design curriculum to allow for the students’ in-depth engagement as perceivers and makers of art. A set of principles guided us as we designed the summer institute and played a central role as we developed The Dinner Party Curriculum. In any attempt to engage students in the exploration of one or more artworks, we believe our “Principles for Teaching,” based on our ideas about art and curriculum, represent solid teaching practice. The Dinner Party Curriculum provides suggestions for engaging students in substantive and serious study of the artwork, based upon our stated ideas about art, curriculum and teaching. Teachers know their students, and recognize what will and will not work within their own teaching settings. Teachers are adept at constructing and sequencing appropriate learning opportunities. We have organized the curriculum around what we refer to as “Encounters.” These Encounters are similar to lessons because they consist of suggested learning activities. We do not, however, list a set sequence of action; nor do we provide objectives, relationships to state or national standards, or suggestions for assessment. We assume that teachers will make adaptations based upon their knowledge of the school or setting in which they teach and the expectations for lesson planning associated with these contexts, the resources and time available, and their own interests and expertise. Since we believe, of course, that all of these Encounters are important for coming to an informed appreciation of The Dinner Party, it is difficult for us to say which Encounters can be given up and which are central. However, we do recognize that students’ readiness and interests vary, as do art program schedules and priorities. We advise teachers to review the various Encounters and when, for various reasons, it is impossible to include all of them in their planning, to try to incorporate the important concepts into those Encounters that can be included. For example, if it is not possible to include Encounter 13 that looks closely at handwork, then perhaps when engaging students in Encounter 8, in which students closely investigate individual place settings, the teacher might have some samples of actual handwork on hand for students to closely examine. The concepts involved in Encounter 9, which examines the butterfly metaphor, for example, might also be introduced in another way perhaps when considering the “table” metaphor, or when looking closely at individual place settings. We wish to emphasize the importance of looking carefully at The Dinner Party and helping students understand it as addressing the erasure of women’s achievements over time by highlighting and celebrating significant achievements of women in the Western world. We encourage teachers to develop a familiarity with all of the Encounters and make choices based upon the extent to which these choices will assist students in coming to understand the artwork in this light. Most elementary and middle school art teachers have the advantage of teaching the same students over a period of several years. This would allow a teacher to return to The Dinner Party more than once, exploring another aspect or dimension of the work and its various contexts. Kris Tuerk, art teacher in the Kutztown Middle School, Kutztown, PA, has created a Dinner Party curriculum that spans the three years in which her students meet with her. Each year focuses upon certain concepts and skills and builds upon those taught in the previous year. Tuerk is one of many art teachers who came to our summer institute and returned to their schools determined to introduce their own students to The Dinner Party through inquiry-based strategies and lessons centered on big ideas and key concepts. We are pleased to present many of these as “Classroom Connections” in our fourteen Encounters. Finally, we remember our own introductions to The Dinner Party as being empowering and powerful. The impact The Dinner Party had upon us then and learning more about The Dinner Party over time influenced our own teaching and ignited our passions as we approached this project. Our hope is that The Dinner Party Curriculum continues to generate ideas for engagement with artwork while the model Encounters help to establish a set of parameters within which these curricular extensions might be designed.